See how the iWrite Wenzi app embodies a revolutionary pedagogy on the first order. Find us at table #8 (partial exhibit hall map at bottom). 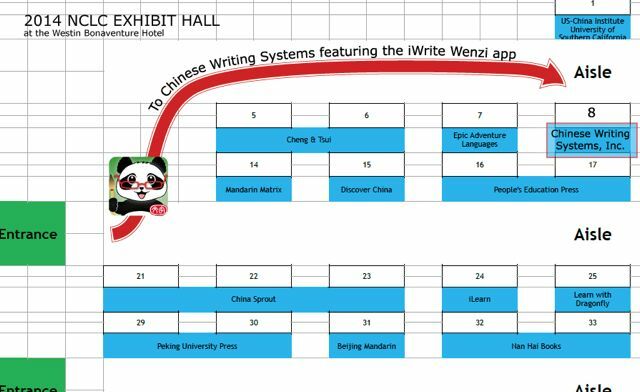 Our curriculum development specialist and one of our main developers will be looking forward to meeting you in the NCLC Exhibit Hall to answer any questions about how students and teachers have already been benefitting from the use of iWrite Wenzi’s ground-breaking pedagogy for making Chinese Writing achievable, engaging and memorable. Teaching and learning to write Chinese no longer needs to be difficult or challenging. Let us show you how Chinese writing in the classroom can be a joy for both instructors and students when they have the tools to explore the meaning, culture and history embedded in the writing system and characters, while also having fun learning to write. The app is being used in Chinese language as well as in Social Science classes with great success. Find out how teachers can use the app to satisfy mandates for multicultural as well as multilingual education, and especially in regards to Chinese language and culture. Come demo and test drive the app! Promo codes will be given away each day of the conference while supplies last.